District 10 Bar Tapas Restaurant allows you to smash your glass bottles, not within their shop but in a customized see-through box. All in the name of relieving your stress. If you want, there is an iPad where you can facebook your boss’s photo and smash your stress. Wonderful idea? “Anybody you hate?” I was asked. And I thought for a while, pondered, and could not find a single person I really wanted to smash. (I love everyone in my life, even my boss). So I went back to the food. There are more than 35 selections of tapas and pinchos (spike in Spanish) that are made of fresh and seasonal produce to choose from. 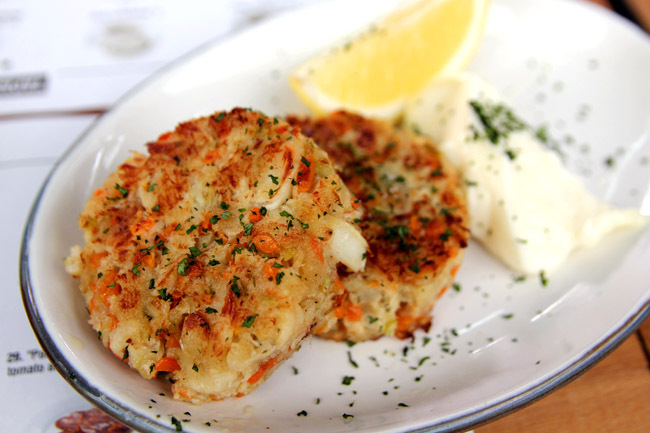 Some of the not-to-be-missed dishes include the Mini Black Angus Cheddar Cheese burger ($7), Manchego Cheese and Jamon Croquette ($8.80), and Jumbo Crab Cake ($14). Most ideal with a cool icy beer. Since there are so many items, let me make some recommendations. 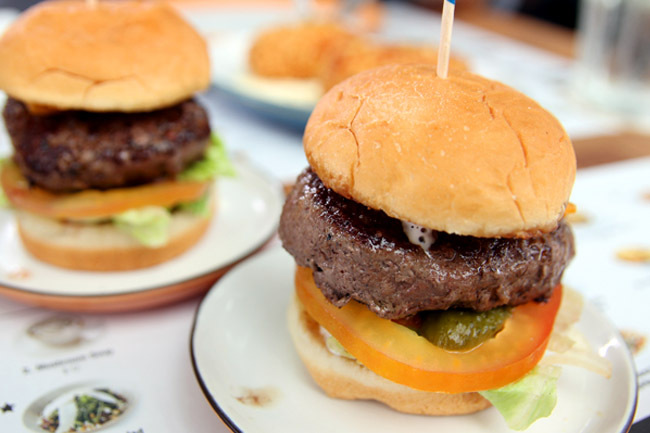 My favourite of the sides is the Mini Burger, with juice tender Angus beef patty and bun that was warm and soft. Epicure once named District’s 10’s Hoegaarden Battered Fish & Chips ($22) as one of the Top Ten Fish & Chips in Singapore, and I would concur with that. It is worthy. The beer battered fish was superiorly crunchy, even though I took some time photographing the dish before taking my bite. The fries were just as addictive and crazy good when dipped into a mixture of mint and truffles sauce. The better news is this Tapas Restaurant is bringing back some of the popular items from the OLD District 10 menu, such as Chilli Crab Pizza, Sambal Prawn Pizza, Beef Rendang Pizza, Wagyu Beef Rendang served with pita bread and Balinese Grilled Chicken with rice. The Soft Shell Chilli Crab Pizza ($25) made me eat more than I wanted to (like 3 slices) because the sauce was just very sweet-spicy-yummy. (Okay, there could be more sauce overall.) 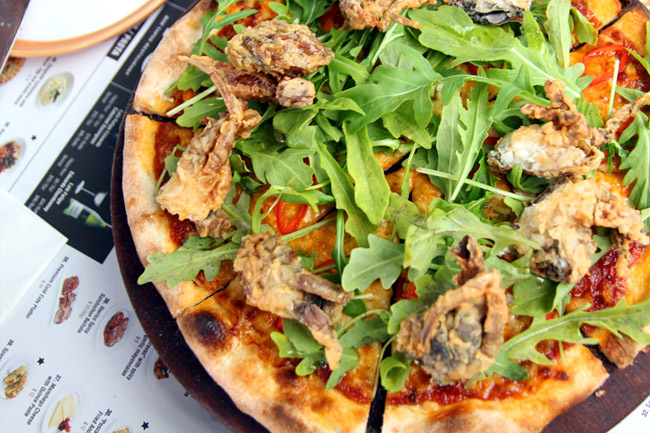 Topped with mozzarella cheese, fried soft shell crab, chilli crab meat and rocket lettuce, this is good to share with four other friends. Desserts are not their strongest forte though. Let’s just say the tastes of the New York Cheese Cake ($10) and Warm Chocolate Cake with vanilla ice cream ($14) did not match up to their photogenic looks, though the District 10 Sour Cheery Sundae ($11) is probably the one you should leave with if you need something sweet and satisfying. [Giveaway Ended] District 10 Bar Tapas Restaurant Giveaway! District 10 Bar Tapas Restaurant at Star Vista will be giving 5 sets of $30 vouchers to 5 blessed Daniel’s Food Diary readers! Step 3: Leave a comment below to say WHY you want to ‘Smash your Stress’. No hatred speech please, be funny & creative! Smash the stress away to pave way for a fantastic 2013! I want to smash my stress to vent my anger and to feel better! The food looks deliciious… I am going to have a great feast @ District 10 Bar Tapas Restaurant so I have the energy to smash out my stress. hope to grab all this yummy food! I want to smash my stress as I've been on a low calorie diet for the last six months. Hurrah for more eating and desserts! I just want to try the food!~ Good luck to myself! I want smash my stress like smash chicken (ayam penyet). Life is stressful, be it at work or personal life. And I cannot afford to travel that frequently to destress. So smashing stress away might be a good alternative. It should be more affordable than shopping? I think smash the stress is a great idea! everyone would need an outlet and I think physically smashing things would help heaps! I would like to smash my boss's photo and vent my anger. I wanna stay young without wrinkles all over my face, so got to smash my stress away! I want to smash my stress just because it’s an excuse to work out on my flabby arms! I want to smash my stress because I couldn’t squeeze out any creative juice for my project and I NEED to smash something to relief my stress! I can’t be smashing laptop in front of my lecturer ya? I want to smash my stress away so I have more stomach space to pig out at District 10 Bar Tapas Restaurant. After a day worth of hard work, it would be great to just eat and have a smashing fun time! I would bring my wife along to smash a few bottles! A couple should work hard and play hard together! I need to destress and 'smash my stress' with all the Christmas, New Year and CNY's pre, during and post activities. It's been too tiring and killing me, haha! 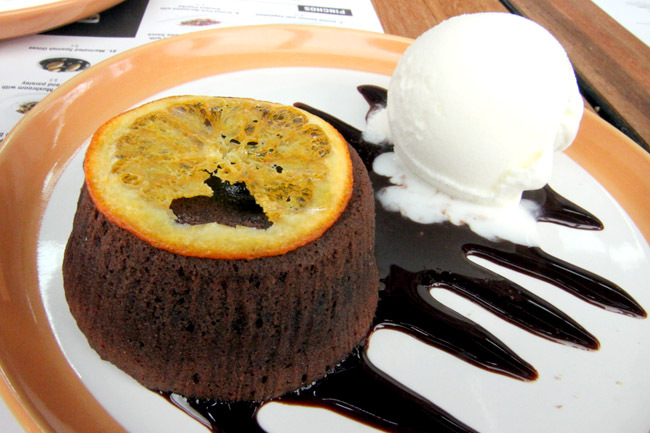 Smash my stress so that I can indulge in the food without stress and fully taste the wonders of the food at District 10 Bar Tapas Restaurant! I wanna smash my stress and make some smash potatoes for dinner!! 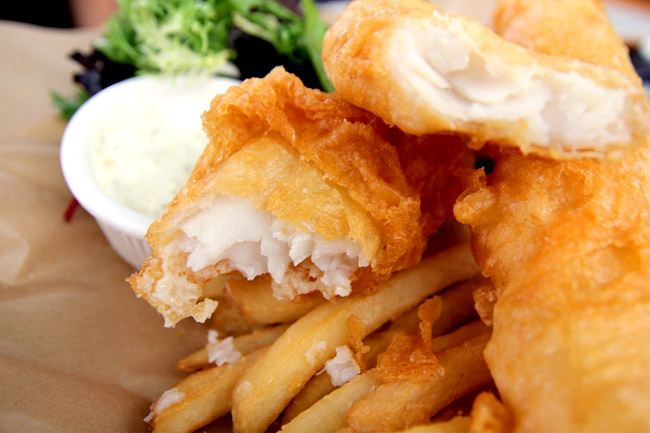 =P The beer battered fish & chips looks sooooo good! I want to smash my stress because common sense is becoming really uncommon! How many restaurants in Singapore allow their customers to smash their glasses? As rare as lecturers in Singapore who allow their students to skip their classes! At District 10 where we can eat and play! Smash my stress to get rid of the bad things and bad luck! I want to smash my stress (due to M1 down time). I can’t make a call or sms.. I want to smash my stress because I am soooo stressed up over having no opportunity to taste District 10 Tapas fooood! I want to smash my stress in order for me to be productive in whatever I do! I want to smash all the things that cause me to waste my Time! I really need a good day of rest! I want to smash my stress or the pressure will blow my head gasket. 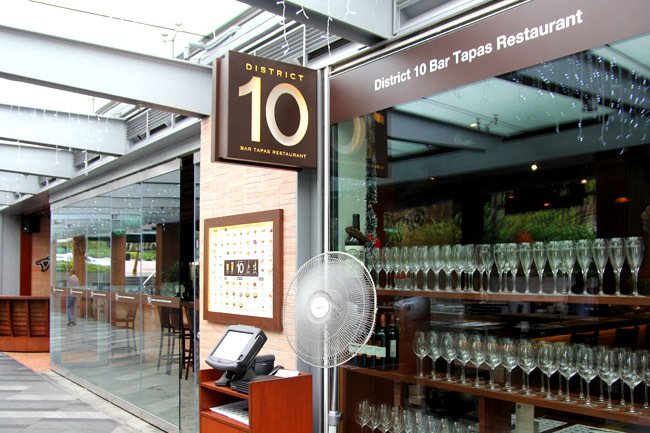 The best way to release my stress is to enjoy a delicious meal at District 10 Bar Tapas Restaurant. I would love a chance to smash my stress as it has been tough to find a job. Was laid off in June and I am still keeping my fingers! Your food reviews have certainly helped me find some of the best food in Singapore. I agree with you that the cupcakes from Swirls are a little too sweet. Please do a review on the best cupcakes in Singapore soon! I want to smash my stress by having a good meal for once in a long time! It's terrible to eat sub standard 'western' food, so this is certainly a treat! I want to smash my stress with good food and enjoying it with my hubby! FOODS LOOK SO YUMMY AND AWESOME LOOKING! I WANAN TRY THEM ALL. Whether it's a date or friends' gathering, enjoying a feast has always been a great method of relieving stress! The chat, the jokes, the food & all those unhealthy substances in the tasty food must have something to do with cheering everyone up. What's more, on top of a great feast in a nicely deco environment, now there's a real stress-relieving exercise – Smashing Bottles! Sounds good! Always relieve stress in such a way that doesn't hurt (emotionally or physically) someone else. More stress only comes about when more irresponsibilities and hurting goes around. So I'm totally cool with this smashing bottles in a see-through box exercise! No life no stress…With stress means that I am alive. So when I woke up a new day, it means that I may have to experience a different set of stress today. For a student whose woes weigh a tonne. I want to ‘Smash my Stress’ in order to find my inner calm, welcome new beginnings & better luck in the new year! I want to smash my stress cause its so frustrating from all the last minute s*$^ at work and the inconsiderate/ungracious commuters who display selfish behaviour when people are trying to board the bus/train to be in time for work! I feel it will be a nice way to relieve stress just by enjoying food here with friends.. I want to have a smashing good time (literally) smashing my stress, thrashing negativity out of my life, and leaving room only for the good things (and food) in life! Congrats to the fellowing 5 winners – Chua EK, Chow Yin Yin, Alex, Jadey and Magdalene! You have each won a $30 voucher from District 10. Please email to DanielFoodDiary@gmail.com with your contact details by 30 Jan 2013. January 17, 2013 at 2:22 am # The food looks deliciious… I am going to have a great feast @ District 10 Bar Tapas Restaurant so I have the energy to smash out my stress. 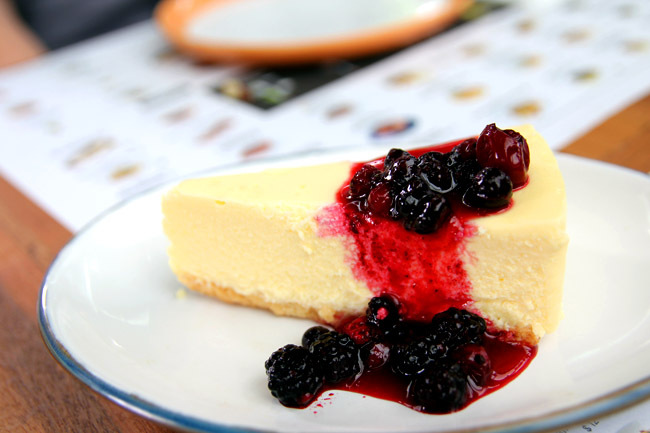 January 17, 2013 at 1:46 pm # After a day worth of hard work, it would be great to just eat and have a smashing fun time! I would bring my wife along to smash a few bottles! A couple should work hard and play hard together! January 17, 2013 at 4:13 pm # Just got back from Spain a week back with all the tapas still swimming around in my head. Definitely need to smash my stress from returning back to Singapore and relive those moments with District 10 Bar’s Tapas!  I want to smash my stress because common sense is becoming really uncommon!